I’m about half way through my Christmas shopping. How about you? It’s getting busy out there! My shopping list is a bit longer this year now that we are back in Ontario. I’ll be able to give gifts to friends and family I haven’t seen in years. I don’t want to break the bank, but I also want to get a nice gift that the recipient can use. I’ve been gifting Schick Holiday Packs for years to my oldest daughter, mom and sisters. This year is no different. I plan to pick up more of these packs to put under the Christmas tree. I like them because they are affordable and will not be re-gifted. Yes, I think about that when I buy gifts! 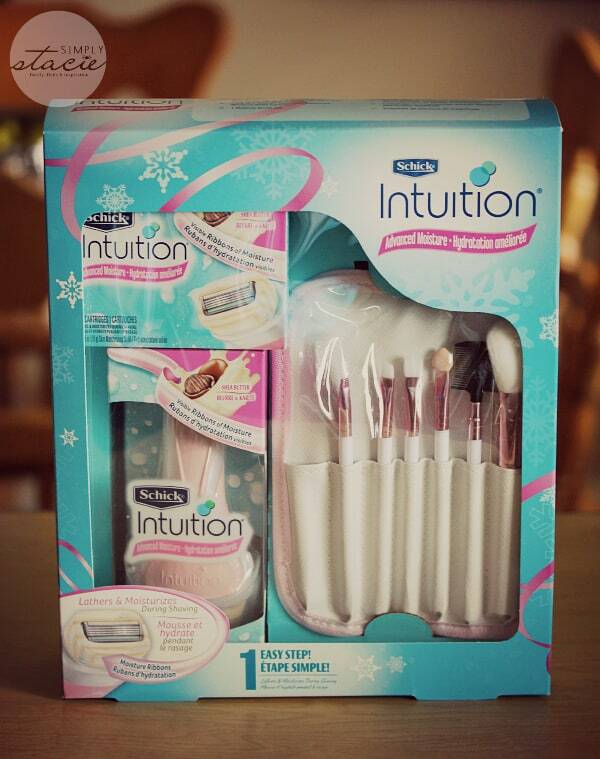 The Schick® Intuition® Advanced Moisture Holiday Pack is great for women on the go. It includes a Schick® Intuition® Advanced Moisture razor with Moisture Ribbons which is meant to be used without shaving gel or body wash. The razor both lathers and moisturizes skin while shaving and has a skin conditioning solid containing Shea Butter to leave skin soft and smooth. The razor handle has a pivoting head and four blades to help you achieve a close shave without nicks. Also included in the pack are a pack of three refill cartridges and a premium makeup brush kit. This set has an SRP of $14.99 and can be purchased at grocery, drug and mass retailers across Canada. 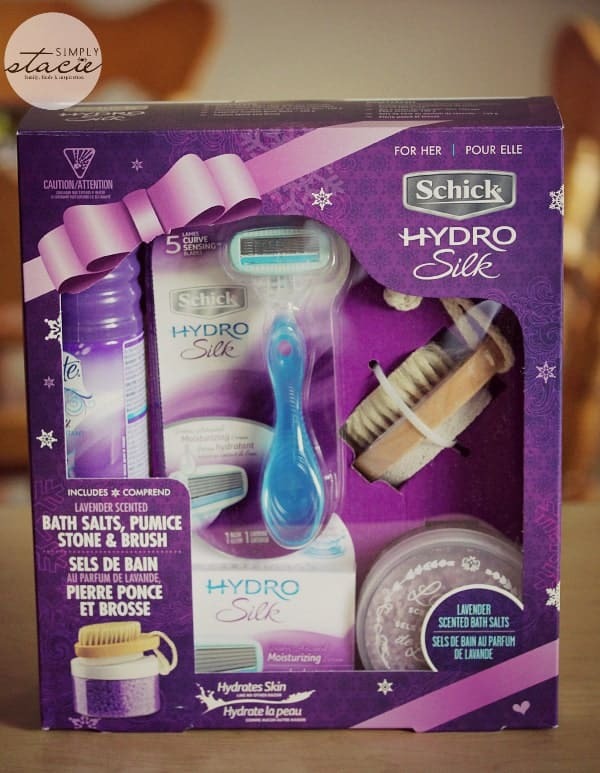 The Schick Hydro Silk® Holiday Pack is for the woman on your list who loves to be pampered! It has everything she will need to create her own at-home spa. The Schick Hydro Silk razor gives an incredibly close shave and has a Water-Activated Moisturizing Serum to help replenish skin’s moisture for up to 2 hours shaving. Good-by dry, itchy (hairy) winter legs! The razor also has five curve Sensing blades with Skin Guards to help protect skin from irritation. It also contains a pack of 2 Schick Hydro Silk refill cartridges, Skintimate Skin Therapy Sensitive Skin shaving gel, Lavender-scented bath salts, pumice stone and brush. I’m giving this set to my mom! She deserves a bit of pampering after how much she helped me this year. This set has an SRP of $14.99. 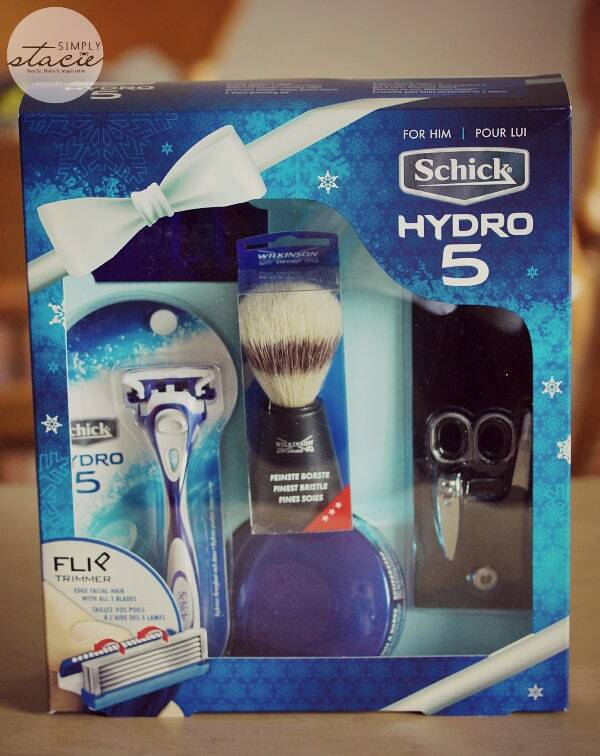 And for the man in your life, buy him the practical Schick® Hydro® 5 Holiday Pack. It’s a gift he’ll use and one that will keep him looking handsome. It includes a Schick Hydro 5 razor with refills. This razor has a Hydrating Gel Reservoir to hydrate the skin while shaving and the five Ultra Glide Blades with Skin Guards help to reduce irritation. It also comes with a Wilkinson Sword shaving soap and finest bristle brush (John already uses these two items) and a 3-piece grooming set. I saw that they grooming set included nail clippers and knew I had to give it to John. He is always taking mine and losing it! This set has an SRP of $16.99. All three sets would also be well-suite for a gift exchange. They are all under $20 and contain items most of us use on a regular basis. Do you have anyone on your shopping list who you think would like any of these three sets from Schick? What a Great Present you could give to yourself!! I love these. I usually add one to my shopping list for my 15 year old daughter. she loves it! I love the Holiday Schick packs and always give one to my son for xmas. Oh, I feel anyone could use a good set like this! I love giving these kits/sets as gifts – they’re practical and they offer a chance for the gift-receiver a chance to try other products from that brand or company! It’s a great idea; I can think of a few names on my list that would love to receive this. Thanks for sharing! Oh I love it, I just wish I could afford 4 of them, oh well was not meant to be, but I would love to give my daughter in-laws one for Christmas. thank you so much for sharing. GOD bless. I have a few people I could gift these to, and they make such great presents! I always love these holiday packs, makes picking up some of the gifts on my list very easy! These are great gift packs, and I too usually gift them out every year!! The women’s sets are perfect for a gift exchange. It’s something that you know will get used. I wish I had the money to buy a gift like this for myself. Have never seen these packaged like this before. Great for Christmas gifts. Thanks. I actually think this is a really great present to get for Christmas. I love these sets. Compact and useful. They work well for giving to adults that we adopt for the holidays. Also, I’ve learned that teenagers often request these in their wants/needs.